Foodies love Celebrity Cruises for its care and attention to cuisine throughout its free dining venues as well as in its for-fee, specialty restaurants. If you don't mind the busy nature of the main dining room, buffet and pool grill, you can eat for free for the duration of your cruise and keep your stomach quite happy. Or if you want to splurge, the for-fee, specialty restaurants are worth every penny. Look for an embarkation day special that will save you 20 percent off the surcharge. (On our sailing that included an overnight in Bangkok, anyone dining in a specialty restaurant on that evening was eligible for 35 percent off the tab.) Specialty dining packages are also available, and the more dinners you book in advance, the more you save. 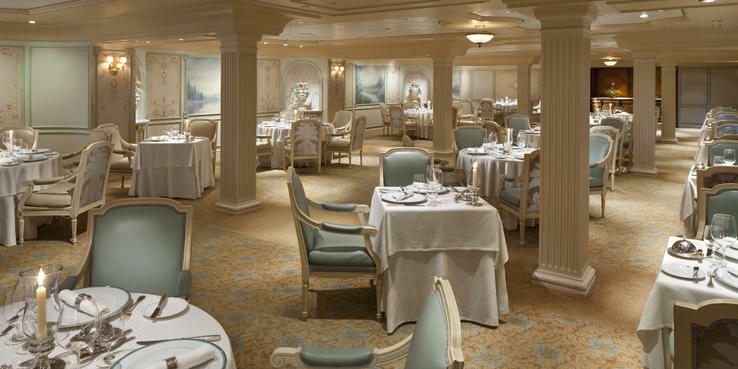 Metropolitan Restaurant (Decks 4 and 5): The main dining room aboard Celebrity Millennium is split between Decks 4 and 5, aft, with set seating at 6 and 8:30 p.m. on the higher floor and Celebrity Select Dining on Deck 5. With Celebrity Select, passengers have the option to dine any time between 5:30 and 9:30 p.m. and to decide whether they want to eat with their own party or at a mixed table with others. Celebrity Select passengers can also make specific, daily dinner reservations online in advance, make reservations onboard or simply show up when ready to eat. During our sold-out cruise, it was a mad rush for tables between 7 and 8 p.m. Arrive earlier or later for a more leisurely experience. The main dining room serves open-seating breakfast daily from 7 or 7:30 to 9 a.m., depending on your itinerary. Regular and decaf coffee, assorted teas and juices (orange, grapefruit, pineapple, prune, apple, tomato and V8) are offered as you peruse the menu. "The Pantry" section of the menu offers things like yogurt and cottage cheese, a cheese plate, fresh or stewed fruits, a charcuterie plate and smoked salmon. Waiters roam the dining room with baskets of muffins, croissants, brioche, sweet rolls and assorted Danish, and you can order toast (white or whole wheat), bagels and English muffins. Hot and cold cereals are also on offer, but the main event for most people seemed to be the "Breakfast Favorites" that included a French omelet with chives and Gruyere cheese, eggs Benedict, a Greek yogurt frittata, and an "Express Breakfast" of scrambled eggs, bacon and toast. You can, of course, also order eggs and omelets made to order or stick with something from the griddle, such as buttermilk or apple pancakes, Belgian waffles or French toast. A variety of side dishes -- American or English bacon; pork, turkey or chicken-apple sausage; corned beef hash; hash browns; baked beans; grilled tomatoes; and sauteed mushrooms -- were also on the menu. Lunch is served at the Metropolitan Restaurant from noon to 1:30 p.m. on sea days only. The menu generally includes three starters, such as delicious creamy mushroom soup, Balinese beef satay, chicken skewers with a sweet chili sauce, a yummy wedge salad with blue cheese dressing or seared shrimp with mango cocktail sauce. Each day there were five main courses to choose from, with selections including grilled filet of barramundi with quinoa pilaf, mussels and chorizo pasta Costa Brava, smoked pork loin with braised sauerkraut, grilled salmon, and Southern fried chicken. For those that don't want a large lunch, opt for something from the "Barbecue & Panini Grill" section of the menu, which offered hamburgers/cheeseburgers, veggie burgers, hot dogs and paninis including tuna melts, Cubans and smoked turkey pesto. For dessert, you can always select ice cream, low-fat frozen yogurt or sorbet, or opt for something like chocolate or fruit mousse, fruit tart, cheese cake or creme brulee. Two wines -- a red and a white -- are also available by the glass or bottle for an extra fee. Lunch and dinner menus are clearly marked with items that are gluten-free, vegetarian, no-sugar-added and lactose-free. The dinner menu also features healthy "Fit Fare" options with less butter and oil and lighter sauces than other preparations. Dinner in the main dining room is a real treat. Starters often include items from the region in which you're sailing. We tried some delicious crispy Thai beef spring rolls and chilled coconut soup with lemongrass, ginger and cilantro. There are usually six or seven starters, which include things such as Belgian endive-arugula salad, Hawaiian tuna poke, smoked ham and split pea soup, shellfish bisque and scallops Rockefeller. There are also four "Timeless Starters" that are always available, including a classic Caesar salad, chilled shrimp cocktail, French onion soup and escargots a la bourguignonne. There were generally six entrees on the menu, and oftentimes it was difficult to decide which to choose. Our waiter offered to bring us an extra main to share, which was a lovely gesture. There were comfort food items like home-style pork chops with marshmallow sweet potatoes and sauteed green beans, and Southern herb-roasted half-chicken with buttermilk cornbread. They also served meaty dishes including aged prime rib of beef, seared strip steak and steak Diane, plus more interesting options like butternut farrotto with caramelized apple, duck prosciutto and sage or homemade gnocchi ai quattro formaggi. There were ample fish dishes to sample, including sauteed tilapia, herb-crusted haddock filet, crab-crusted flounder and broiled Australian sea bass. There are also three always-available "Timeless Entrees": broiled wild Pacific salmon, grilled chicken breast and grilled New York sirloin steak. If you have room for dessert, you can select from ice cream, frozen yogurt or sorbet, or a range of other yummy treats that range from all types of cheesecakes, cakes, mousses and creme brulee to favorites like Key lime pie, Bavarian apple strudel and a scrumptious clafoutis. Oceanview Cafe (Deck 10): Even people who generally hate buffets are enamored with Celebrity's Oceanview Cafe. We talked with many passengers who looked forward to dining at Oceanview Cafe but hardly ever visit a buffet on other ships or on land. Celebrity chefs do an amazing job presenting an array of delicious items at breakfast, lunch and dinner. And for those with special dietary requirements, there are sections of the buffet dedicated to gluten-free, vegetarian and no-sugar-added selections. You can get water; coffee (Lavazza); teas like Darjeeling, Earl Grey, chamomile, peppermint, English breakfast, decaffeinated, Ceylon, green, black and mango (Stassen and Fields & Selects brands); and juice at the buffet from self-service machines 24 hours/day. Juice stations vary, so walk around to find what you like, including orange and a yummy passion fruit/orange blend. Nestle hot-chocolate mix is also available from the self-serve stations, and you can order additional for-fee beverages (nonalcoholic and alcoholic) from the wait staff that walk the dining room. There are also two walk-up bars -- one aft on the outside deck and one inside -- in case you don't want to wait for a server. An early continental breakfast is served from 6 to 6:30 a.m., with the full breakfast buffet lasting from 7 to 10 a.m. Late breakfast is available until 11:30 a.m. At breakfast, you'll find eggs (poached, hard-boiled, scrambled) as well as omelet and Benedict stations. The farthest station aft offers waffles, pancakes and French toast. Walk around the entire buffet for fruit (sliced, whole or stewed), pastries, bread and rolls, cheese and sliced meats, yogurt, oatmeal, cereal, muesli and some Asian/Indian fare like congee, stir-fried noodles, eggs bhurji and puri. American-style bacon and sausage, as well as corned beef hash, are available, as is a full British breakfast with grits, black pudding, bangers and more. Lunch stations (open noon to 2 p.m.) include hot entrees, ethnic fare and desserts. The many flavors of scrumptious ice cream and toppings (served from noon to 10 p.m.) are not to be missed. A salad bar, pizza and pasta stations are open from noon until the late evening. Casual afternoon tea -- including scones with clotted cream and jam, plus a selection of tea sandwiches -- is served from 4 to 5 p.m. From 6 to 9 p.m., passengers can choose from around-the-world dinner offerings, including sushi, a carving station, Asian food and more. Themed nights may focus on Indian or Italian fare. Items that were especially tasty during our cruise included the carved roast pork, eggplant Parmesan, shepherd's pie, fish and chips, palak paneer, beef satay, mie goreng (Thai-style noodles) and sambal eggs. AquaSpa Cafe (Deck 10): Located in the Solarium, this buffet-style venue offers a light, healthy breakfast from 7 to 10 a.m. You can enjoy low-fat yogurt parfaits; cereals including museli, granola, oatmeal or shredded wheat; omelets with fingerling potatoes and cherry tomatoes; and organic breads such as tomato Provencal, eggplant and pearl onion, or wild honey and ginger. Wash everything down with juice or a smoothie. Lunch is available from noon to 2 p.m. Look for the "soup of the day" and a salad bar, plus dishes like a light-fare antipasto platter that includes prosciutto, eggplant caviar and smoked fish. Popular items include the fruit plate, vegetable wrap and sesame udon salad. The food is complimentary, but you will pay $5 for fresh pressed juices, $6 for smoothies and $10 for baby coconuts ($13 with a shot of rum). Pool Grill (Deck 10): Open from 11:30 a.m. to 6 p.m., the Pool Grill was perhaps the only disappointing meal we had onboard Celebrity Millennium. It wasn't bad, but it was forgettable. You'll find hot dogs and hamburgers as well as special-order turkey, veggie and gluten-free burgers. French fries are available, too. During busy times, premade items are warmed in steaming trays. Ask for your meal to be prepared to order. It will take 15 minutes, but it may be fresher and tastier. You can purchase beer and soft drinks here but no wine. Blu (Deck 5): Blu is Celebrity's spa-dining venue, exclusively for AquaClass passengers. Those booked in suites are allowed to dine here, too, space permitting. Open for breakfast (7:30 to 9 a.m.), expect healthy offerings such as fresh grapefruit or seasonal melon, yogurt/granola parfaits, muesli, fruit and cheese plates, smoked salmon, French toast, eggs and omelets. This venue isn't open for lunch but serves dinner from 5:45 to 9 p.m. Passengers raved about the Angus beef carpaccio with black truffle aioli, vichyssoise with seared shrimp and charred leek oil, and blue cheese soufflé. Signature entrees include Dijon-glazed salmon salad with mizuna greens and pickled vegetables, sauteed red snapper with a chorizo-white bean cassoulet, and pan-seared filet mignon with celery puree and green asparagus. Timeless Classics of Atlantic salmon, New York strip steak and roast chicken are available nightly. Luminae (Deck 4): Suite passengers have access to Luminae, an intimate VIP dining room that's open for breakfast (7:30 to 9 a.m.) and dinner (5:45 to 9 p.m.) daily, and lunch (noon to 1:30 p.m.) on sea days. This gorgeous dining venue features windows onto the ocean, delicate glass lighting fixtures that hang from the ceiling and frosted glass panels with the same tree limb motif that's reprised on the dining room's brown carpet. The room is small but comfortable, and makes you feel like you're dining at a Michelin-starred restaurant on land. Continental-style breakfast includes items such as fruit, charcuterie, cheese, smoked salmon, baked goodies, muesli and yogurt/granola parfaits. Eggs and omelets are available made to order, as are eggs Benedict and huevos rancheros. If eggs aren't your thing, go for French toast and berry compote, buttermilk pancakes, Belgian waffles or caramelized apple crepes. Sides include the usual bacon, sausage, potatoes, biscuits, corned beef hash, baked beans, grilled tomatoes, sauteed mushrooms and cheddar cheese grits. Coffee, tea, juices and smoothies are also served. The lunch menu may be on the small size but it's packed with delicious flavors. Appetizers range from hamachi crudo with yuzu-soy dressing; roasted beet salad with feta cheese, orange, fennel and a lemon vinaigrette; and cream of parsnip soup with roast apples and country bread croutons. Lighter fare is available by way of Luminae's sandwich menu, which includes standbys like a turkey club, crab cake sandwich with remoulade sauce and Old Bay spiced chips, braised pork belly BLT, and the restaurant's signature hamburger, served on a sesame brioche bun with truffle fries. Entrees range from braised short ribs to ricotta ravioli with wild mushrooms to roasted trout. There are always two desserts to choose from, with options that may include berry pavlova, chocolate lava cake or cheesecake. At dinner, expect a selection of four appetizers (think smoked trout or fresh mozzarella with prosciutto, arugula pesto and peasant bread), five entrees and three desserts. Suite passengers seemed to especially enjoy the seared duck breast with parsnips, trumpet mushrooms, Swiss chard and sour cherry jus. The grilled filet mignon with truffle potato puree and Bordelaise sauce was another hit. Desserts included a rich chocolate ganache tart, baked Alaska and coconut tapioca with passion fruit. Room Service: Room service is available 24/7, and a door-hung card assures you'll get breakfast when ordered. The menu is a mix of complimentary and paid items. Expect to pay extra for appetizers including crab cakes, beef tartare and tomato/mozzarella salad (about $10 to $11 surcharge for each), and entrees such as filet mignon, sea bass and ribeye (about $20 surcharge for each). Everyone (except suite passengers) pays a $4.95 fee when ordering room service between 11 p.m. and 6 a.m. Tipping a few dollars for room service is customary. Tuscan Grille (Deck 3); $45 at dinner; $35 at lunch: Tuscan Grille is open for dinner nightly from 6 to 10 p.m. and occasionally for lunch (noon to 1:30 p.m.) on sea days. Be sure to arrive hungry because the portions are generous and you'll want to sample a few things across the menu. Starters include items like Kalamata bruschetta, beef carpaccio, crispy calamari and Berkshire pork belly with a sweet cider glaze. You can also opt for an antipasti board that consists of fontina, gorgonzola, pecorino, prosciutto, finocchiona, olives and fig jam; it's large enough for the table to share. Salads range from a classic Caesar to an incredible heirloom beet salad with grilled artichokes, cannellini beans, caper berries and farro in a red wine vinegar. If you prefer soup, go for the minestrone or cannellini fagioli. Two flatbread pizzas are generally on the menu, as are a handful of homemade pastas (that also come in half portions). Try the lobster rigatoni Alfredo, the short rib pappardelle ragu or the more traditional spaghetti and meatballs. Fish entrees such as branzino, snapper and tuna are on offer, as are a variety of butcher cuts including a 10-oz. beef ribeye, 12-oz. grilled skirt steak (deliciously creamy), 9-oz. filet mignon, 10-oz. veal marsala and a 16-oz. lemon-garlic brick chicken. If you really want to celebrate fine dining, order a dry-aged sirloin steak ($15 surcharge for an 18-oz. portion or $8 for a half portion) or a 22-oz. USDA prime, dry-aged porterhouse for an $18 surcharge. If you have room for dessert, go for the creamy-yet-light limoncello cheesecake or the fig gelato. Qsine (Deck 11); $45 at dinner; $35 at lunch: All the way at the top of the ship, this gourmet restaurant interprets ethnic and comfort food in a way you've never seen before. All meals are served in innovative vessels -- never a standard plate or bowl -- and are meant to be shared. Couples will enjoy the experience but be stuffed by meal's end. Sharing with a larger group really is the best way to experience this restaurant. The menu, presented on an iPad, includes standouts like Kobe beef sliders, sushi lollipops, "disco" shrimp (poached tiger shrimp) and, for dessert, decorate-your-own cupcakes. The decor is equally funky with mismatched chairs and table lamps that hang upside down from the ceiling. Qsine serves dinner nightly from 6 to 10 p.m. and is sometimes opens for lunch (noon to 1:30 p.m.) on sea days. Sushi on Five (Deck 5); a la carte pricing: Not enough passengers discover Sushi on Five, tucked behind Cellar Masters on Deck 5, but this restaurant is a gem. Open for lunch (noon to 3 p.m.) on sea days and dinner nightly (6 to 10 p.m.), come hungry for a variety of starters, sushi rolls and sashimi. Standout items were the Kobe beef ramen sliders with shaved radish, mizuna, fried onion, tobiko and ginger aioli as well as the pork tonkotsu ramen and lobster ramen. The eel dragon, spicy tuna and shrimp tempura rolls all got the thumbs-up as well. Japanese desserts are on offer, but you can also walk over to Cafe al Bacio if you're looking for a more traditional sweet treat to end your meal. Cafe al Bacio (Deck 5); a la carte pricing: Don't miss the delectable sweets at Cafe al Bacio; the premium coffee and tea (and bar drinks) will cost you -- unless you've purchased select drink packages -- but the desserts are always free. Try the carrot cake, lemon tart, strawberry mousse, eclairs or blueberry cheesecake. Jars of cookies top the bar here, and are of the crisp (not chewy) variety. Drinks range from espresso ($4 to $5), cappuccinos, caffe lattes and caramel macchiatos ($5) to a variety of high-end teas ($5 to $6). Gelato is sold here as well: the cost is $4 to $6 for a cup or cone, $4 for a cookie gelato sandwich and $7 for "spaghetti" gelato (which are basically different gelato sundaes).